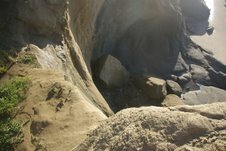 I had a chance yesterday to explore the tunnel in the cliffside near Pescadero Beach. I’m convinced the tunnel was part of the coastal defenses, hurriedly constructed after the Japanese attack on Pearl Harbor. I’m hoping to get confirmation of this soon from local authorities. 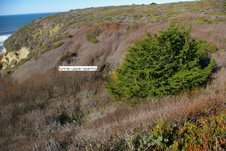 Parking off Highway 1, in the tunnel’s vicinity, I decided to retrace the path I had used before, on my first visit, as it had been a much easier trek then the horrendous cross-country, bushwhacking trip to it. 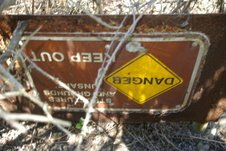 Unfortunately, while heading in this direction, I saw the front of the sign I hadn’t read when I exhaustedly passed it while escaping out of the canyon that first time. It forcefully urged me to STAY BACK. UNSTABLE CLIFFS. 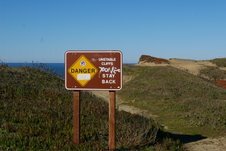 The well-trodden path to the cliff’s edge let me know that a number of scofflaws had not taken this sign seriously. I assume there is no law violation involved, but I’d urge other adventurers not to follow this path, as the cliffs are very unstable here, especially with the winter’s rain. Having been startled more then once while walking local beaches as large chunks of cliffside crashed onto the sand beside me for no apparent reason, I did take the warning seriously. Moving parallel to the sign, I found a small animal trail that eventually joined the faint trail descending into the canyon further on, but a safe distance from the cliff’s edge. The faint trail peters out at the edge of the steepest slope near the bottom of the canyon, but if you’re determined and confident, it is not too hard to find a fairly safe path to the gully’s floor. 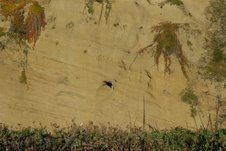 Following the gully seaward, I arrived at the sheer 40- foot cliff that drops to the rocks on the beach below. 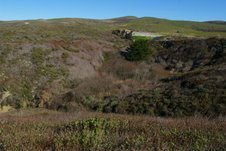 From there I could see the tunnel opening, above me, on the north side of the cliff as it turns eastward into the gully. I had to be extremely careful; it’s very muddy and slick there. As I tried to climb towards the opening, I recalled slipping and sliding on my first trip, ending up soaked thigh high, sunken up to my knees in slimy mud. I had to find another way to enter the tunnel and a ladder was not going to help. There was only an eight- foot drop from the tunnel opening’s floor, but it led to a narrow, water-filled pool with unclimbable walls, left and right. There was no place to rest a ladder at the face of the cliff. Even the mud at my side of the pool’s depression was so squishy that my shoe almost vanished into the ooze without my putting any weight on my foot. I was stumped. It was then I remembered something I had seen while channel surfing the night before. I stayed online long enough to watch a show called “Ninja Warrior,” where contestants competed in a series of timed Challenges involving the navigation of obstacle courses. One difficult “challenge” involved inching along between a pair of four-foot-apart parallel Plexiglas walls for about 40 feet, keeping themselves from falling into the cold water below. The contestants accomplished this by exerting outward pressure on the Plexiglas with their hands and toes. But the slippery walls, coupled with physical exhaustion, tossed several challengers into the drink. I thought I might apply a similar technique, and come up with a better result. Climbing to a spot on a sloped ledge to the left of the tunnel opening, I slowly inched towards it until the slope was too steep to risk any further movement. Then, gathering all my courage, with arms extended, I toppled over, heading for the cliff on the other side of the pool. The extreme physical moves sent a shock through my shoulders, but it worked. At least it worked for the moment. But there was no going back now; I could only press onward or fall downward into the pool. Nearly horizontal, with hands and feet pressing firmly against the opposite sides of the narrow slot canyon, I was suspended seven feet above the pool. Moving my hands and feet alternately, I began a clumsy sideways shuffle towards the opening. Fortunately, my friend Meg didn’t want to approach the slick muddy parapet below the opening, just above the 40- foot drop to the beach, so she couldn’t photograph the fear rippling across my face. I didn’t think I’d be seriously hurt, but my camera and pride might not have survived a fall into the quagmire below and I’m certain it showed. Reaching the tunnel’s opening, I was able to rest on the sloped remnants of the rock floor that hadn’t been eroded by the water flowing through it. 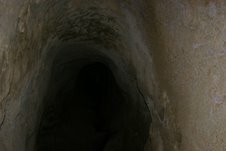 Holding my small LED flashlight in my mouth, I continued to move deeper into the cave’s darkness until I could finally drop to a solid-looking part of the muddy stream bottom, worn six feet down from the tunnel’s original floor. Walking further in, I came to a sheer, seven- foot cliff that someone had cut shallow handholds into. Using my flashlight I could see there was a short side tunnel above me that may or may not have had another branch off it. But, around the corner to the right, I didn’t need my flashlight to see the light at the end of the tunnel. There was a second opening, partially covered with brush, about a 100-feet ahead. I tried to scale the cliff using the handholds, but was unsuccessful. Likewise, the branch leading to the opening was unclimbable. Satisfied, I shot a few pictures and headed back towards sunlight. I was able to retrace my steps successfully, and soon was blinking in the bright sunlight with a big grin on my face. Having related to Meg what I found, we decided to check out the other end of the tunnel to see what we could find. Heading upstream, we quickly realized as we stood in the wet, spongy, heavily overgrown bottom of the gully, that it was going to be very difficult. Instead, we climbed back up to the road and headed north on Highway 1. Unable to see the tunnel’s opening in the tangle of growth below us, we each took our guess at the best route and started battling downward. I made a bad choice and was soon in over my head, caught in a thick tangle of spiny vines and heavy underbrush that looked suspiciously like poison oak without its leaves. Turning tail, I struggled back to the road, from where I could just see the top of Meg’s head in the brush below. I decided that since I knew about how long the tunnel was, it might be easier to go across the northern rim of the canyon to the approximate spot above where I thought the opening was and then head straight down. That worked fairly well, except that when I reached the gully’s bottom, the opening was nowhere in sight. Heading upstream, bulldozing the thickets of small rotted trees that blocked my way, I headed towards the direction of Meg’s voice. Shortly, I stumbled on the topsy- turvy sign shouting KEEP OUT! STRUCTURES AND GROUNDS UNSAFE. I felt sure I was close, and that my surmisal that this tunnel had been an observation post was correct. Thirty feet away, down a steep bank I was able to shout: “I see it!,” just as Meg burst free from the thicket of bushes above me. I entered the cave and gingerly straddled the eroded gap in the floor to just above where I had turned back when I entered it from the other end. Mission accomplished. Returning to the upper opening, I noticed there was part of a concrete footing that probably had supported a door to seal it way back when it had been used. After all, they wouldn’t have wanted “frogmen teams” to sneak up on them and slit their throats before they could sound the alarm. My belief is that some time after WWII, just as with the “tsunami Prankster cave,” I’ve written about, this cave was considered a public nuisance. Officials posted a sign warning people to stay out, and forgot about it. Because of its virtual invisibility, they probably felt plugging it wasn’t necessary. I saw absolutely no sign that anyone had visited this spot in many years. In fact, I can’t imagine there are many people that would bother. Nevertheless, I’m very happy I did. The entire expedition helped me to visualize what those frightening times after Pearl Harbor must have been like. America, reeling from the blow, was frightened it would happen again and reacted with both vigor and panic. The string of coastal defenses and the brave people who manned them, were an important feature of that critical time. This entry was posted in John Vonderlin, South Coast beaches, WWII Coastside. Bookmark the permalink.